From Chris, at V-O, comes another terrific link: the ARROW bicycle company. So nice. Fun, minimalist, and practical, for the most part. My ADD envies your style. "Simple is best," is ARROW's mind. Sinse 1972. There is a corporate site, if you want to call it that, and sites for shops in several cities. 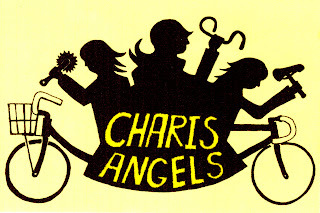 One of them contained this little drawing of "Charis Angels." Nice. Thanks Chris! 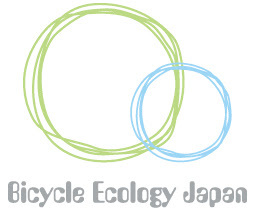 Bicycle Ecology Japan: I haven't dug deep, but it has a nice name and logo, and looks promising. And for something a little different, below is a picture of Darren's bell. 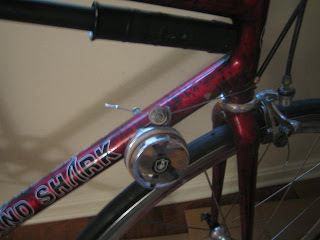 It's actuated by a carbon Record brake lever. Perhaps the only carbon Record bell, ever.